HEBREW LETTER: Reysh, head (especially the front of the head, or face). The Divine Countenance anthropomorphized onto the Sun. The head as seat of consciousness, intelligence, and illumination. Also means source, origin, and that which “heads” or directs, guides, rules. CARD NAME: “Sun” comes from Old English sunne, which, like the Latin sol and the Greek helios, comes from the Indo-European root sawel- (which simply means “the sun”). All of the well-developed astrological, alchemical, Qabbalistic, and otherwise occult associates with the Sun should be considered in attempting to understanding the meaning of this Trump name. ESOTERIC MEANING: The Universal Consciousness. Through it, astrologers derive their judgments of the stars and (zodiacal) constellations, and perfect their knowledge of the celestial cycles. TANTRIC & ALCHEMICAL SIGNIFICANCE: Regenerated male and female as children before the Sun. DIVINATION: Light, Life, Love, and Liberty. Glory, gain, riches, triumph, liberation, pleasure, frankness, candor, truth, shamelessness, self-disclosure, self-knowledge. Health. With very adverse cards, it means arrogance, self-aggrandizement, display, vanity. I feel a burst of warmth, exuberance and energy as I sit inside of the orange sphere. Centrality, the center of attention, self-centered, beauty and radiance, warmth - the warmth of the human heart - the warmth of genereosity and love OR scorching, overbearing and dominating heat. Blinding brilliance, passion, spreading enthusiasm, living and breathing life into one's surroundings. All of the signs of the constellations gather around the sun, it disperses its energy freely to them, each of them. - Celebration, joy, energy, verve, life, the will to live, passion; the Holy Place inside every one of us; source of Beauty and Life; publicity, openness, giving/emanating. - The head: that which governs, in the sense of consciousness; awareness, consciousness. - This is star experienced as “my star”, in the sense of: being-here, being-intimate. - A lot of children… I feel love and Purpose – in these children being here, through the relationship with them, it emanates the feeling of Purpose. - That which is continually-renewed; life which does not end. - Focus, core, essence, will (pure and free, in its fullness). - Play, in the sense of Homo Ludens. - Children holding hands and dancing in a circle – they form this snake around the hill. 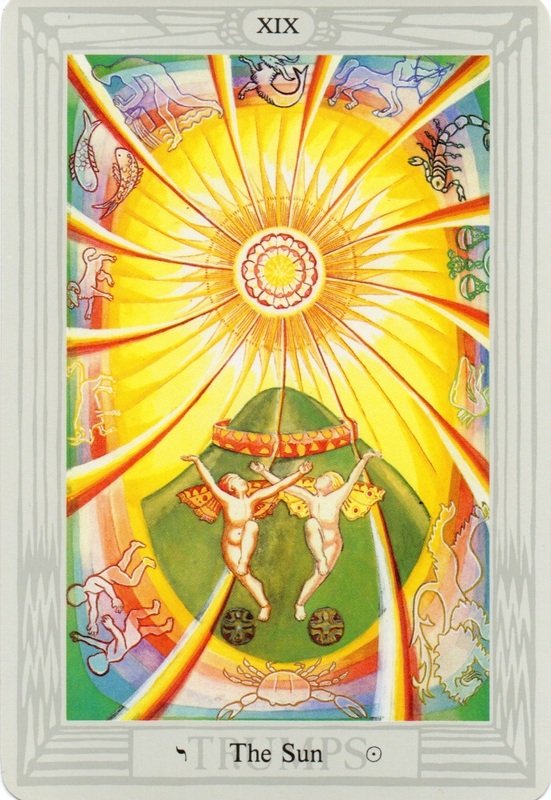 - The Sun in the middle of the card becomes a heart, and that’s the heart of Jesus, from his chest bright-yellow-gold light shines; now I see this two different pictures – Jesus and the children dancing in circle, making a snake around the hill --- change of Aeons. - Now the Sun draws my attention; I look at it and realize that our incarnations are like this motion of the Sun “through” constellations; the Sun is an ark (a boat), it carries the soul; ARK – this is a “secret name” for the Sun. …As if: our essence, our core, that is Sol, and the incarnations are various “clothes”, sort of “masks” – they serve as various forms for the Sol-essence to manifest itself; Sun is a “boat” (a sort of chariot that specifically carries over water) for Hadit. - Triumph, freedom, celebration of Life. - A black “copy” of me extracts itself from myself (sitting in asana during this meditation); nothing peculiar or specific about it, it’s just a black figure; this “event” creates the feeling/impression of being divided, but at the same time being one – a strange, paradoxal experience when thinking and writing about it, but it was quite natural while happening. - I focus on the color of the card again. Sun from the card appears; I feel it burning inside my head, shining out through “third eye” point. - Beauty initiates; Beauty is dynamic, is giving, it exists for its own sake (no purpose “outside”). - Now I see the whole construction of this card’s images as a pictorial representation for hexagram 56 from I Ching (Li above Ken, Sun upon the Mountain, “The Traveler”/”The Wanderer”). - Duality, in the sense of Pair, this is a core principle for this Path. - Eyes drawn to flower first but quickly relocate to the hilltop. The rays pouring over the crown like ribbons rather than light. I am trying not to get caught up on the imperfections but... My mind wants to search for hidden meaning in everything it sees. In these cards, every time it runs into something out of sync it wants to find a reason. When there isn't one apparent, it gets angry that it was led down the garden path. In a card like this that is so regular and "designed", the feeling is that much stronger. Diving into the cards while chemically altered tended to alleviate these hangups by literally breathing life into the figures. Blemishes and faults became sources of motion and scintillation. Perhaps that really is the best way for me to train my mind to get out of the way. RHK & HPK look so light and carefree. How does one attain that state? Time to find some butterfly wings and a twin and go skipping naked down Glastonbury Tor. What are those things at their feet? Coins? A bit of Earth grounding the unbridled positive energy? Poor Virgo. All smushed on the side. And Taurus; outlines blasted gold and indistinct. Libra gets a solid green treatment and Scorpio blue while everyone else is lumped together as grey. EDIT: Just checked a better rendered version of the card and realized that all of the signs are in their appropriate colors. However, that one cuts off Virgo and Aries' heads even more. - Orange-egg meditation reminds me to be a source of energy and joy rather than criticism. Mind is scattered at this point. Gently bring attention back to creating orange egg. Form a Resh and Sun symbol in blue. Orange doesn't want to come. Tired and unfocused. Fail. - I've always assumed that the two kids are fairies with butterfly wings but, as portrayed in the card, the wings are not emanating from their back. They look instead like hair-extensions. Possibly butterfly wings attached to their hair as some sort of nemyss. Aside from that, it's remaining very difficult for me to find deeper meaning through these meditations when my eye is constantly distracted my seeming mistakes or sloppy construction. I can appreciate the time and effort it must have taken to paint 78 final images over the course of 5 years with no real payment involved. However, as a mind that is looking for a tool to lift it above the mundane and into the divine... this just isn't cutting it. Stop judging. Send your solar energy out into the world. Illuminate the shadows instead of making more. - Decided to lie on my back for closed eye meditation to see if it might help me to let go of physical and fall into subconscious mode. It allowed for a much longer meditation than in dragon asana but no more revelatory. I either fell asleep for part of it or dropped into a subconscious level that didn't leave any memory impressions (I guess these are really the same thing). Lesson: Keep sitting in asana. - Read over a symbolic description of card first this time through. Established blue stone of Water under fiery RHK and brown stone of Earth under airy HPK. All of the positive life-affirming energy blasting forth from the solar rose is thus grounded in the lower elements. This isn't the wild ungrounded energy of the Prince of Wands but a concentrated, focused, vibrant blast of solar L.V.X. All that energy causes it to spin in its place, sending out its beams in a gentle spiral. If this card were alive, it wouldn't be spinning with the buzzsaw danger I saw in The Universe but it does have that potential. The closer one gets to the Rose, the sharper the blades of the light beams get. - The green of the hilltop grows on a copper base, Netzach crowned with a wall/ring of Geburah in its final approach towards Tiphereth. - Closed eye meditation is grounded and relaxed but doesn't add any insight. Go in all ways contrary to the world. I am immediately aware of the dynamic rays radiating out toward while simultaneously pulling me inwards to the center. There is a hypnotic effect and an illusion of movement. The rays are like the multitude of hands giving me a warming embrace. Inside the Sun is what seems to me like a flower with two rows of petals amounting to 24 petals, 2 and 4 adding up to 6 – the solar number. This same numbering system appears in the smaller sun rays. Large rays extend out to encompass the 12 signs of the zodiac. The sun’s central location indicates their dependence upon the Sun, it being figuratively as the father figure and zodiacal signs signifying the children. The signs of the zodiac are placed within the rainbow which is the solar light itself reflected differently and uniquely in dependence upon specific qualities and characteristics of that against which it bounces – in this case the temperament of each sign. In other words, the divine grace of the Father is reflected uniquely in each one of the children. Indicates the cyclic nature of the psyche – this image standing in stark contrast with the dark night of the soul, hence the Sun can stand as a symbol of victory over darkness/dark thoughts/negativities of mind. The inner and outer battles between the darkness and the light gives the Sun an attribute of a warrior and a king. I notice that the sun rays curve as if it were rotating widdershins - counterclockwise. Why would that be? I would have expected Deosil - "sunwise"
That's the way it's spinning from your perspective. What direction is it spinning from it's own perspective, facing you? AliceKnewIt wrote: I notice that the sun rays curve as if it were rotating widdershins - counterclockwise. Why would that be?